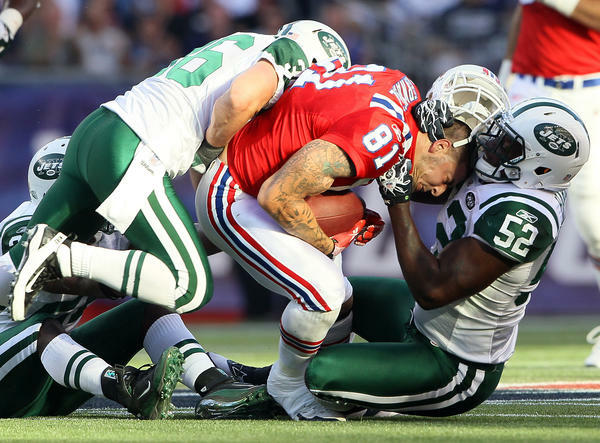 Aaron Hernandez (81), of the New England Patriots, lost his helmet during this play against the New York Jets in 2011. Hernandez killed himself in 2017, and researchers found that he had had one of the most severe cases of CTE ever seen in someone his age. A study published online Thursday in Brain, a journal of neurology, presents the strongest case yet that repetitive hits to the head that don't lead to concussions —meaning no loss of consciousness or other symptoms that can include headaches, dizziness, vision problems or confusion — cause CTE. "We've had an inkling that subconcussive hits — the ones that don't [show] neurological signs and symptoms — may be associated with CTE," says Dr. Lee Goldstein, an associate professor of psychiatry at the Boston University School of Medicine and the lead investigator on the study. "We now have solid scientific evidence to say that is so." And this evidence, he says, leaves researchers "terrifically concerned." "The concussions we see on the ballfield or the battlefield or wherever — those people are going to get attention," Goldstein says, "because it's obvious they've had some sort of injury. We're really worried about the many more people who are getting hit and getting hurt — their brain is getting hurt — but are not getting help because we can't see the evidence on the outside that their brain is actually hurt. It's a silent injury." Translating Goldstein's concern to the football field, Chris Nowinski, who heads the Concussion Legacy Foundation, says, "We see the hard hits all the time, where a guy pops up and smiles and [signals] a first down, and [we think], 'OK, that hit was fine.' But what this study says is: No, that hit probably wasn't fine, and that poor guy can't feel the damage that's happening in his brain right now." "It suggested that maybe concussion isn't the index or metric that we should be following," he says. "Rather, maybe it's something about the hits and number of hits that might be important. That's what we wanted to nail here." "It took us many years to do this," Goldstein says. "We see in our animals — even after a small number of hits, even one — very early evidence of pathologies associated with CTE." "I want to be very clear on this," Goldstein says. "This is in no way to minimize concussions." "We're not taking concussions out of the equation," Nowinski says. "Concussions are still very bad." They can still cause acute brain injury that leads to long-term symptoms, he says, independent of whether they spark a neurodegenerative disease. "We still have to respect and address [concussions], even more than we have in the past." Dr. Julian Bailes isn't a household name. Not like, say, actor Alec Baldwin. But the two are linked on this issue — Baldwin played Bailes in the movie Concussion. Bailes chairs the department of neurosurgery at NorthShore University Health System in the Chicago area; he wasn't involved with Goldstein's study, but followed the work and calls it "good science." "It's a comprehensive study," he says, "and I believe it adds a lot to our knowledge and the medical literature concerning this topic." Bailes says the work dovetails with findings he and others published in 2013. "We've known for a few years that it's not just the known or diagnosed concussions that may increase risk for [CTE]," Bailes says. "It's probably the exposure. It's how many hits to the head that have occurred and at what velocity and what extent." He notes the first case of CTE for an NFL player, discovered by his colleague Dr. Bennet Omalu, was the late center Mike Webster who "played football 27 years and never had a known or diagnosed concussion." Bailes thinks the study published Thursday adds to the evolving narrative about head impact and the long-term consequences. "It certainly adds to our science and our understanding," Bailes says. "And hopefully it adds to greater protection, greater safety and the ability for all ages to enjoy contact sports." "We stood firm against an [expanded] 18-game schedule and insisted on changes to the work rules in 2011 to limit contact of all types to protect players, and this study reinforces we made the right decision. We have been in close touch with the researchers at Boston University, who are also members of our Mackey-White Health and Safety committee, and we will review this study carefully to consider future changes to improve the health and safety of our players." Delay start of tackle football for kids? Still, Goldstein and Nowinski aren't so sure young kids should be playing contact sports at all. "The longer you play, and the earlier you start playing, you'll suffer more head hits [and put yourself at] greater the risk for CTE," Goldstein says. "That's what all the evidence [in the study] was suggesting." He and Nowinski believe student-athletes shouldn't play tackle football until high school. Bailes doesn't believe the study offers evidence that early exposure to head hits makes a football player more likely to develop CTE. Six years ago, he notes, Pop Warner became the first football organization at any level to legislate against having head contact drills in practice. Since that time, from the NFL on down, Bailes says, there has been a marked reduction in styles of practice or techniques that lead to gratuitous head contact. And new rules at all levels have helped eliminate egregious open-field head hits or head targeting, he says. Urging kids to play flag football until high school wouldn't actually provide the solution people seek, Bailes says. High school is when the real risk to student-athletes begins. "That's where the players become man-sized and run fast and have high velocity collisions and hundreds of them a year," Bailes says. As to the question of where to draw the line in terms of what age kids should start playing tackle football — "this study doesn't answer that," Bailes says. "There's been no answer to that question." It's an individual choice, he believes; parents and kids need to consider the risks and benefits. "There are about 10 people who drown every day in the U.S.," he says, citing statistics from the Centers for Disease Control and Prevention, "and we're not calling to outlaw swimming." "Intimate partners who are having repetitive head injuries," he notes," domestic violence victims, homeless, children at risk, people in our prison systems. [With] all of these people, we need to take the focus off concussion and find out if they have injured brains." Football has been getting a lot of criticism in recent years as information comes out about the long-term toll of head trauma. Today there's more tough news. Scientists now have what they call solid evidence that repeated hits to the head cause the degenerative brain disease CTE even if there's no concussion involved. We'll have more from NPR's Tom Goldman. TOM GOLDMAN, BYLINE: In the evolving science of head trauma, concussions have been the thing. From battlefields around the world to football fields in the U.S., we've heard about the dangers of when the brain rattles around inside the skull. We've heard about the possible link between concussion and the degenerative brain disease chronic traumatic encephalopathy. A number of former NFL stars have developed CTE, which can cause cognitive problems and dementia and lead to suicide. And in 2015, the injury even became part of popular culture. WILL SMITH: (As Dr. Bennet Omalu) A human being will get concussed at 60 G's. A common head-to-head contact on a football field - 100 G's. GOLDMAN: This is actor Will Smith in the movie "Concussion." SMITH: (As Dr. Bennet Omalu) God did not intend for us to play football. GOLDMAN: But now a team of researchers says all the focus on concussions may be missing the mark. Boston University professor Lee Goldstein was the lead investigator on a study released today in the journal Brain. The research found the real culprit when it comes to CTE isn't concussion with it's often recognizable symptoms that include loss of consciousness, dizziness, confusion. But rather, it's the more common and less obvious hits to the head. LEE GOLDSTEIN: Although we have had an inkling that the subconcussive hits may be associated with CTE, we now have solid scientific evidence that that is so. GOLDMAN: The study was seven years in the making. Researchers examined the brains of young adults and did head impact experiments on laboratory mice. The results, says Lee Goldstein, are concerning. GOLDSTEIN: We're really worried about the many more people who are getting hit and getting hurt. Their brain is hurt. GOLDMAN: But he says they're not getting help because with a focus on concussion, their less-obvious head injuries are overlooked. GOLDSTEIN: It's a silent injury. GOLDMAN: Chris Nowinski of the Concussion Legacy Foundation translates Goldstein's concern to the football field. CHRIS NOWINSKI: We see the hard hits it's all the time. Then a guy pops up and smiles and points to the first down. And suddenly you go, OK, that hit was fine. And what this study says is, no, that hit probably wasn't fine, but that poor guy can't feel the damage that's happening to his brain right now. GOLDMAN: Nowinski and Goldstein are hoping the study results prompt policy changes. In fact, today the two men and some former NFL stars launched a campaign calling for kids to hold off playing tackle football until high school. That's obviously not a popular idea with youth football organizations like Pop Warner. Dr. Julian Bailes is a noted expert on head and brain trauma. He's also a medical adviser to Pop Warner. Bailes coauthored a paper in 2013 about the effects of subconcussive head hits, and he disagrees with the idea of holding kids out of tackle football until high school. It's there, he says, that the game gets more dangerous since kids are bigger, faster and have more violent collisions. JULIAN BAILES: The question is, where do you draw the line? This study doesn't answer that. There's been no study to answer that question. And again, it's not just football. It's other sports that have the risk for head contact, including ice hockey, lacrosse, soccer and others. GOLDMAN: But today the focus is on football, where the risk is greatest. In response to the study, the NFL and its players union sent statements vowing to keep working to make their game as safe as possible. Tom Goldman, NPR News. (SOUNDBITE OF FLORATONE'S "FLORATONE") Transcript provided by NPR, Copyright NPR.